Last time I talked about how magnetization arises from the alignment of spins, which is favorable in some materials due to the quantum mechanical exchange interaction. But, there is another way to generate a magnetic field: it turns out that moving charges (i.e. an electric current) create a magnetic field as well! This was first observed experimentally by Ørsted, who noticed a compass needle moving in response to current running through a coiled wire. It was then incorporated into Maxwell’s Equations, which attempted to provide a unified framework for observed electric and magnetic phenomena. From the reference frame of the charge, an electrical field is induced by a static charge. From the reference frame of a static observer, a magnetic field is induced by a moving charge. The implication is that electric and magnetic fields, and forces, are simply two facets of the same phenomena, which is now called electromagnetism. 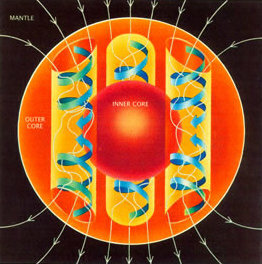 In fact, the magnetic field of the earth, shown above, is due to moving charge in the form of molten iron in the outer core of the planet. The charge flow is maintained because magnetics fields induce current flow, just as current flow induces magnetic fields, forming a feedback loop. The earth’s magnetic field is not very large, but it is enough to enable measurement devices such as compasses, which have long been used for navigation. Some animals are also able to sense the earth’s magnetic field to directly use for navigation, including homing pigeons, sharks, and even smaller organisms such as bacteria. Many different biological sensors for magnetic field seem to have evolved independently, likely due to the significant survival advantages associated with reliable navigation. But another place where the magnetic field induced by a moving charge arises is in electronics. Any wire with a current running through it will generate a magnetic field proportional to the size of that current. That means that nearby objects that respond to magnetism may experience magnetic forces, or even have electric currents induced in them. Coaxial cable, which has an inner wire carrying current encased in an insulator and a cylindrical outer conductor, confines the magnetic field to the insulating region of the wire. It was developed specifically to shield the magnetic field of the current-carrying wire, and to shield the wire itself from stray external magnetic fields. And there is a basic circuit component that makes use of this phenomenon as well, the inductor. 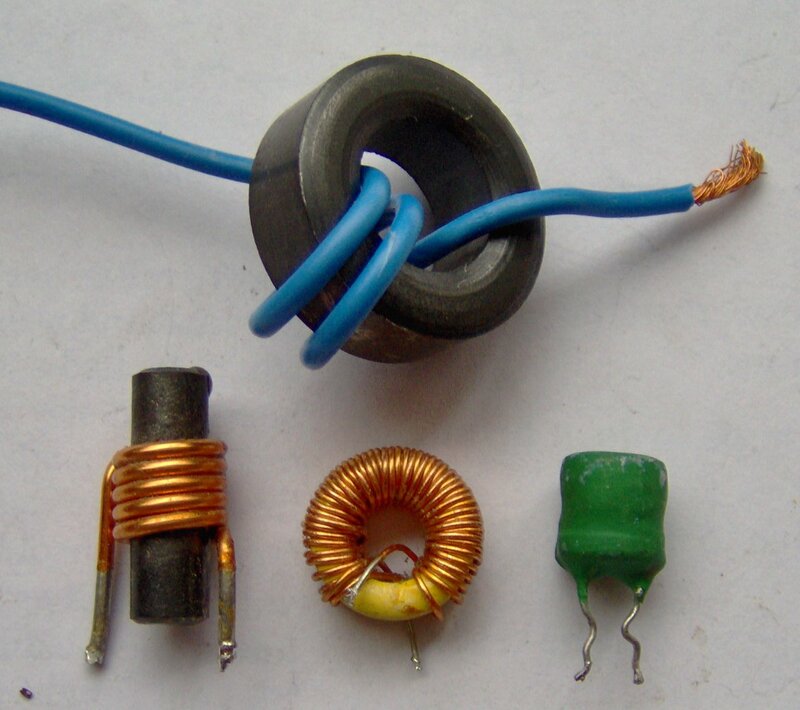 An inductor, as you can see above, consists of wire coiled in a loop, possibly with many coils and possibly with a material lodged inside the coils of wire. The current on the wires induces a magnetic field in the center of the loop. The forces from this magnetic field act against any change in electric current, using the energy stored in the magnetic field. Because inductors are sensitive to changes in current over time, they are very useful in processing time-dependent electronic signals. The magnetic field of one inductor can also be coupled to the coils of a second inductor, inducing a second current which may be larger or smaller depending on the relative sizes of the coils of the two inductors. This is how a transformer is made, a device which inductively transfers electrical signals and is central to power transmission from the power grid to individual homes and businesses. As you can see from all these examples, there are a lot of technologically useful things to do with the interplay between electricity and magnetism! And the realization that they were intertwined was a huge step forward for physics.